ESDMAN 001-9904 Grounding System Monitor is an ultra-precise alarm apparatus for grounding system monitor with the test precision of 1%, which is used to monitor the contact status between the workflow ground wire and the earth and enable to monitor 4 ground wires in real time (over the ground conditions of the visible grounding bare copper wire or underground unfathomable concealed wiring and underpinning, etc.). ▪ Communication mode: wireless transmission or RS485, more than 1000 test records can be saved in off-line status. ▪ Bicolor (red and green) alarm light can be externally connected. ▪ 1 grounding wire can be monitored in real time; automatic sound-light alarm; real-time monitoring of grounding status to ensure production safety. ▪ The resistance can be set according to the requirements of working grounding resistance value which can more accurately monitor the grounding system. 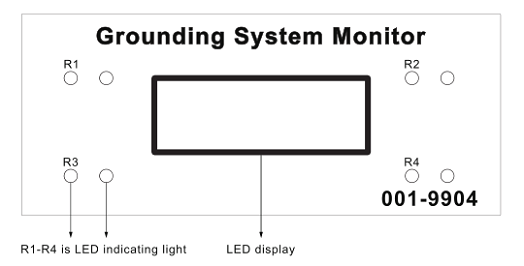 ▪ Embedded LCD display, strong display functions with real time display and monitoring status for resistance setting value and tested resistance value. 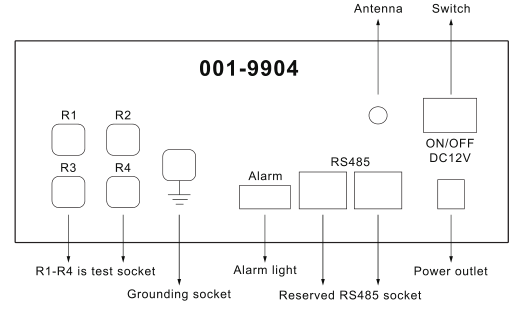 ▪ The range of grounding system monitoring resistance value is 0-100Ω and appropriate gear may be selected according to different use regions; when the loop resistance of the grounding wire is higher than the setting value, sound-light alarm will be trigged immediately. The instrument precision is 0.1%. ▪ Convenient for use, with no need for additional auxiliary grounding facilities. ▪ Capable of overcoming blind spot in grounding measurement, and completely measuring out the actual aground and underground grounding impedance to avoid static damage and electric shock to personnel. ▪ Connect the lead of alarm light to the wiring card of alarm output as per positive and negative electrodes (red is positive and black is negative) at the back of cabinet. ▪ Connect the red earthing rod at the back of cabinet to the workbench or equipment and the black one to the grounding wire or static wire to form a loop. ▪ Connect power line and set the resistance value as required and then the alarm apparatus of grounding system starts to work.